In the heart of Death City lies the Death Weapon Meister Academy. While attending the academy, meisters and weapons work hand in hand in an effort to hunt down dangerous souls and bring order to the world. 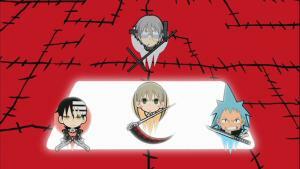 Maka and Soul are students following their path toward their goal of transforming soul into a “Death Scythe”, the personal weapon of Lord Death. Its exam day at the academy as everyone’s studying hard for the “super written exam”. It’s rumored those who place the top score are the most likely to succeed in producing a Death Scythe. Everyone’s feeling the pressure and emotions are running high. It’s a fairly straightforward filler episode with an over abundance of comedy as the series preps for yet another turn for the dark. Afterward, Death the Kid finds himself on a reconnaissance mission, investigating a ghost ship thought to be linked to the disappearances of hundreds of souls. It’s not long before Kid comes face to face with the Demon Sword Meister Crona, prompting a battle to erupt. This serves as a precursor to the next arc, wherein the witch Medusa begins her assault on Death City. Back at the academy, everyone is celebrating the anniversary of the school’s founding. This allows Medusa the opportunity to set her ultimate plan into motion: unleashing the ultimate demon, the Kishin. With the majority of the students and the staff sealed forcibly sealed within the school, Dr. Stein, Maka, Black Star, and Kid journey into the catacombs beneath the academy where the Kishin sleeps. Dr. Stein stays behind to fend off both Medusa and his own increasing madness, while Maka is confronted once again by Crona in a rematch from the previous set. Determined to avenge herself as well as free Crona from Medusa’s grasp, Maka undergoes a dangerous ritual, pitting her sanity against his soul. Meanwhile, Kid and Black Star arrive just in time to intercept the rest of Medusa’s forces. Unfortunately, the Kishin’s madness has already begun to spill out, infecting everyone in the facility. It’s not long before it finds itself freed, wasting little time in laying waste to those around it, eventually leading to a clash with Lord Death himself. The episodes that follow take an understandably lighter tone as the group heals up and gets some much needed rest and relaxation. Several new faces are introduced, with many of them just as over the top as the current cast, as Lord Death recalls many of former graduates. The rumblings continue when a former enemy is enrolled in the academy, making things awkward for everyone. 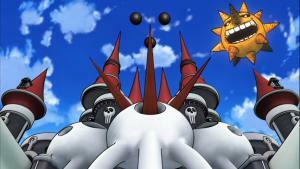 Action is Soul Eater’s forte and this set promises no shortage. The individual battles between the meisters and Medusa’s group are wildly inventive and sure to please even the most jaded of fight fans. Quality-wise, these episodes are stunning, showcasing animation that rivals any you would see in a cinema as well as pacing that never feels disjointed or slow. The characters unique quirks play a hand, making them a pleasure to watch. 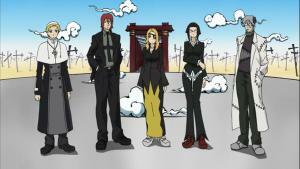 Soul Eater Part 2 continues to uphold the standards established in the first release. The abundance of action and growing focus on story development put this set a notch above the first. Those looking for depth won’t find it here; rather, if you’re a fan of exquisite animation and explosive action, then this set is essential viewing.